On Saturday 22nd October Mr Sticky Fingers Cake Co and I went over the border to Suffolk to deliver a scrummy naked wedding cake to the gorgeous Smeetham Hall Barn, just outside Sudbury on the border of Essex and Suffolk. 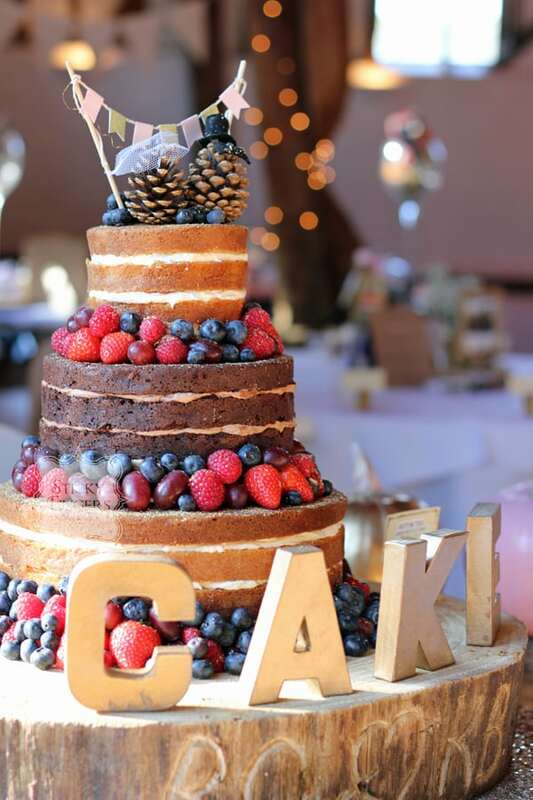 Michaela and Ricky got in touch with us through our website having seen that we had delivered a naked wedding cake to Smeetham Hall Barn last year. They live in London so was unable to come to Sticky Fingers Cake Co HQ for their consultation so we sent their wedding cake samples through the post and chatted about their cake through email – simple! In the end the flavours they chose were Lovely Lemony Lemon Cake, Rich Dark Chocolate and Madagascan Vanilla. Instead of dusting the naked wedding cake with icing sugar, Michaela wanted it sprinkled with gold edible glitter, to give it a bit of shimmer and decorated with fresh berries. It was a gorgeously, sunny, Autumn day and the barn looked amazing with lots of gold and pink painted pumpkins everywhere! Congratulations Michaela and Ricky! Have a long and happy life together..